I was 6 months pregnant with my son when I babymooned in Naples, Florida with my husband. That week was the best week of my life for so many different reasons. 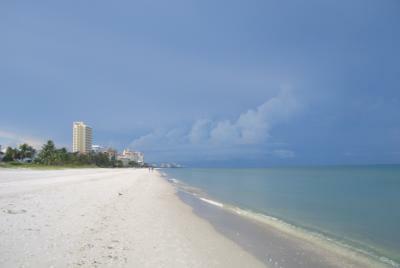 My husband and I stayed at the Ritz Carlton in Naples, close to Vanderbilt Beach. We were pampered and simply relaxed our bodies and our minds for 6 days. I even treated myself to a pregnancy massage while I was there and my husband was able to get a massage at the same time! It was a wonderful time to bond. The sunsets were amazing on Vanderbilt beach. I have never seen a sky so beautiful! We took walks on the beach and relaxed by the pool... We shopped at the quaint little area shops and ate ice cream that was out of this world! I really feel that the week in Naples allowed my husband and I to get away from the hustle and bustle of the world for a while. We were able to enjoy each other and reflect on how our world was about to change for the better. It was really a special place to vacation and I am hoping to go there again someday ~ maybe for a family vacation! Sounds like a wonderful, relaxing babymoon. Check out our Florida Babymoon Page for more great babymoon getaway ideas.